Many people who are involved in garden history actually have come to it through related fields of study: landscape architecture, architectural history, or art history. 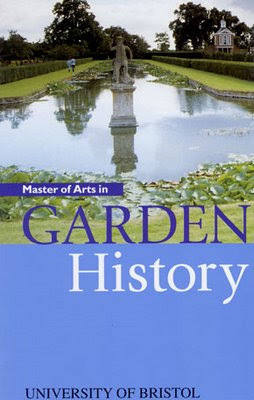 And you can, while studying for a graduate degree in one of these fields, specialize in the study of historic gardens. But I wanted a more direct route, when I realized, after lots of reading purely for my own interest, that one could actually get a degree in the subject. There is one program available in the US, at the Bard College of Design in New York City, which I seriously considered. As one might expect, there are a variety of training opportunities within the UK; they can be found on the aforementioned website of the Garden History Society. I ultimately chose to enroll in the Garden History MA from the University of Bristol in England. It gave me the option of fulfilling the degree in one year (intense but doable; most do it in two), which was the longest time I could take off from work. And I had come to realize that whatever program I was in, a great deal of study would be devoted to the great English gardens. I wanted to learn from them firsthand instead of in books. And that was a primary consideration for me...I'm interested in the actual place of gardens, not in sociologic analysis or marxist reinterpretations, or the garden's 'non-human interactions' (that's an actual quote; I have yet to figure out what it means). But I was still uncertain when I took advantage of a cheap winter airline fare and flew over for just a few days to see the program and meet the tutor, Tim Mowl. The quality of the program, as well as Professor Tim's intellectual curiosity and enthusiasm for both his field of study and his students, decided me. When Tim took me 'round Stourhead, explaining its history, the paths and grottos and temples were suddenly animated. I went home and told my department chair (this would be the department of Chemistry and Biochemistry) that I wanted to take a year off and go to England and study Garden History. He took it rather well, considering. "not in sociologic analysis or marxist reinterpretations, or the garden's 'non-human interactions' " Oh, my gawd....that's one of the best lines I've read in months! Good for you. I found your blog through Blotanical, and have become a fan, because you write very well and I'm learning about aspects of gardening I had known next to nothing about. That's another garden I've been to - Stourhead! I went there years before had a digital camera, so my pictures are few and poor, but eventually I'll post about Stourhead, mostly because Delaware Park in my neighborhood was designed by Olmsted - based on what HE saw at Stourhead!